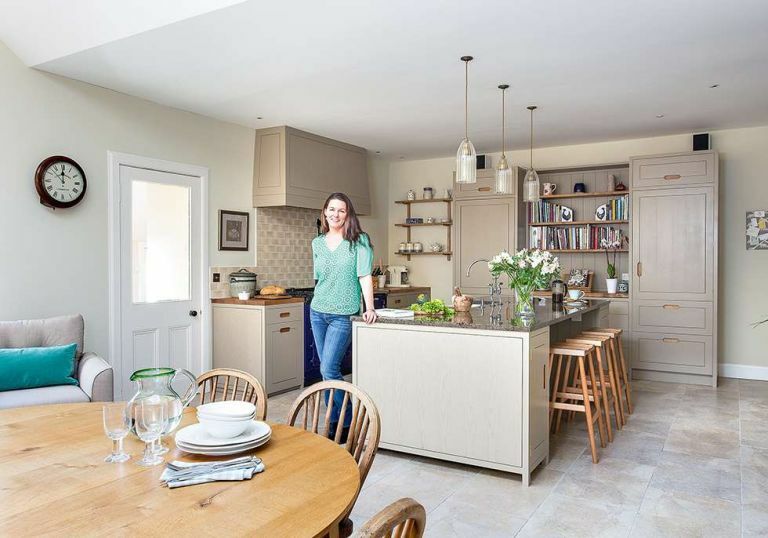 Nicola and Ed Legget updated their kitchen and extended to create a spacious dining area. Find out how they achieved it, then browse through more real home transformations and learn more about extending a house. The timescale was one of the main challenges. Nicola and Ed bought the house in July 2013, and their son was born that September. The house was watertight and weatherproof from the following March, and they moved in during April. The impact of the kitchen project was felt throughout the house. A lot of mess was created upstairs when two beams that had protruded into the kitchen were pushed up into the ceiling joists. Originally, there had been only one low beam in the kitchen ceiling, from a previous structural alteration; a second was necessary when the extension required a supporting external wall to be removed, but the couple decided that two beams would have been unsightly in the space. ‘It delayed us settling in, but it was good that we were forced to do so much right at the start of the project,’ says Nicola. The kitchen – apart from the finishing touches – was completed by July. ‘It’s the centrepiece of the house; we both love it,’ says Nicola. ‘Although it’s more contemporary than we would have usually chosen, we trusted Colin and allowed ourselves to be led by him. His natural style is quite trendy, but our design is classic, as he knows our taste. Ed carried out extensive research into the lighting design, seeking help from experts and choosing unusual fittings that meld beautifully with Colin’s cabinetry. The couple also took into account the new units when choosing appliances, opting for an integrated fridge-freezer and a concealed icemaker so as not to spoil the clean lines. Design details give the kitchen an unfitted feel, as though it is made up of freestanding cabinets. ‘Ed loves the island’s “floating” appearance — the floor tiles running beneath make it seem somehow less imposing in the centre of the room,’ Nicola explains. A major unforeseen cost was having to replace the original windows, which were not the right fit for the new stone on the extension. Nicola and Ed had three sash and casement double-glazed windows made. ‘It was frustrating because they don’t look any better than the old ones, so they added a lot of extra expense for an invisible result,’ says Nicola, who has given the room personality with stylish fabrics, while opting for practical furniture perfectly suited to family life.